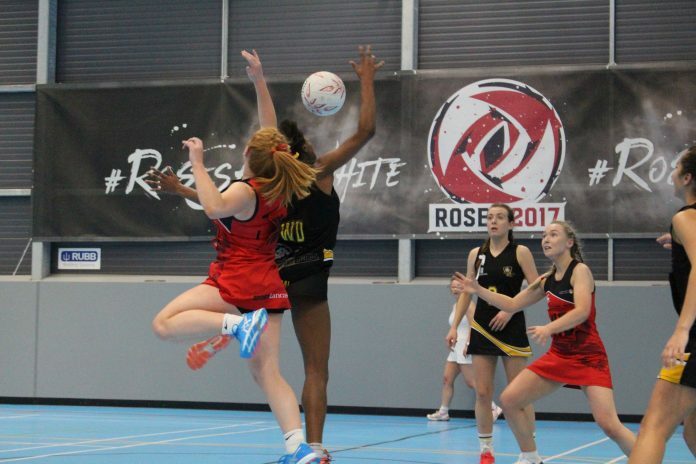 Fast, intense, electric – the three words which best describe the netball match between Lancaster and York’s Women’s Firsts. Walking into the Sports Arena expectations for the match were high, with one spectator even commentating that ‘apparently it’s like watching an England game’ – it was a match that lived up to, and surpassed expectations. With a total of 93 goals, equating to just over 1 and a half goals each minute, everyone watching was in awe and on the edge of their seats. The beginning of the match was tetchy, with the teams remaining within a goal or two of each other, taking it in turns to be in front. Tensions rose as time went on, manifesting in cautions for touching and being too physical. The skill of the players shone through, clever passing and technique-perfect footwork showed both sides to be on top-form. It was end-to-end action with the crowd responding well to this, being vocal and supporting their team. Lancaster started to gain a lead in the 3rd quarter; their ability to win aerial battles, get away from their markers and precision passing giving them the edge. As the final quarter drew to a close, Lancaster were scoring for fun and racked up an impressive 21 goal lead when the final whistle went. Despite the 21 goal deficit, York were not out-played – if someone were to watch a 5 minute clip of the match, they would not be able to say who was on top. Next articleWhy should you ditch Google?